Synopsis: In Strega Nona's village, the holiday season is a time of celebrations - and nothing says celebration like a feast! All the kitchens are bustling from the Feast of San Nicola, when the children choose the food, to the Feast of Epiphany, when someone gets to be king or queen for the day. Even the animals share in the holiday spirit, and when Big Anthony smells the delicious treats Strega Nona is cooking for them, he decides that just a taste couldn't hurt, right? Wrong! Big Anthony gets his just desserts, while Strega Nona surprises everyone with a special gift. About the Author: Tomie dePaola (pronounced Tommy da-POW-la) is best known for his books for children. Review: I remember reading Strega Nona as a kid. I loved the story, and the pictures. 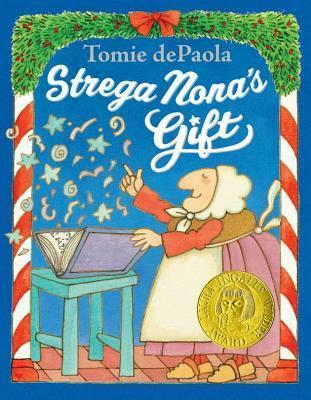 I'd never read Strega Nona's Gift until now, but I can't say I was disappointed. The story is a great introduction to the holiday season from a traditional Italian viewpoint. Big Anthony just can't stay out of trouble, no matter the time of year.